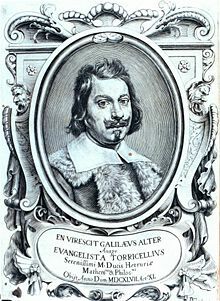 Evangelista Torricelli portrayed on the frontpage of Lezioni d'Evangelista Torricelli. Evangelista Torricelli (October 15, 1608 – October 25, 1647) was an Italian physicist and mathematician, best known for his invention of the barometer. In addition he was a pioneer in the study of the motion of fluids and was regarded by some (notably Ernst Mach) as the "father of hydrodynamics." His contributions to science include: a theory describing the relationship between temperature, air density and wind; mathematical equations describing the rotations of curves and solids which led to the development of calculus; and a physical evidence and philosophical arguments proving the existence of a vacuum. His assertion of the occurrence of a vacuum in nature contradicted the Aristotelian view held by authorities of his time. Torricelli was born in Faenza Papal States, near Ravenna, Italy. The family was poor and his father died at an early age. Subsequently Evangelista, the eldest son of the family, was placed under the care of his uncle, Jacopo, a Camaldolese monk, who first entered young Torricelli in a Jesuit College in 1624 to study mathematics and philosophy until 1626, when he sent Torricelli to Rome in 1627 to study science under the Benedictine Benedetto Castelli, professor of mathematics at the Collegio della Sapienza in Pisa. Torricelli's statue in the Museo di Storia Naturale di Firenze. Aside from several letters, little is known of Torricelli's activities in the years between 1632 and 1641, when Castelli sent Torricelli's monograph of the path of projectiles to Galileo, then a prisoner in his villa at Arcetri. Although Galileo promptly invited Torricelli to visit, he did not accept until just three months before Galileo's death. During his stay, however, he wrote out Galileo's Discourse of the Fifth Day. After Galileo's death on January 8, 1642, Grand Duke Ferdinando II de' Medici asked him to succeed Galileo as the grand-ducal mathematician and professor of mathematics in the University of Pisa. In this role, he solved some of the great mathematical problems of the day, such as finding a cycloid's area and center of gravity. He also designed and built a number of telescopes and simple microscopes. Several large lenses, engraved with his name, are still preserved at Florence. In 1644, he famously wrote in a letter: "We live submerged at the bottom of an ocean of air." Torricelli died in Florence a few days after having contracted typhoid fever, and was buried in San Lorenzo. The asteroid (7437) Torricelli was named in his honor. Torricelli's chief invention was the barometer, which arose from solving an important practical problem. Pump-makers of the Grand Duke of Tuscany attempted to raise water to a height of 12 meters or more, but found that ten meters was the limit to which it would rise in the suction pump. Torricelli conducted a series of experiments designed to investigate the phenomenon that water could be pumped only to a finite distance in a vertical tube. In exploring the paradox he decided to use mercury, which is fourteen times as heavy as water. In 1643 he filled a glass tube which was about one meter in length with mercury, then inverted the tube open end down in a dish with additional mercury. Finding that about thirty inches of mercury remained in the tube, he concluded that a vacuum had been created in the space above the mercury. Furthermore, he explained that the mercury was held in place not by the vacuum, but by the pressure of the air pushing downward on the mercury in the dish. Repeating the experiment he found consistently the column of mercury fell to about 70 cm, leaving a Torricellian vacuum above. As we now know, the column's height fluctuated with changing atmospheric pressure; this was the first barometer. This discovery has perpetuated his fame, and the torr, a unit of pressure, was named in his honor. Torricelli also discovered Torricelli's Law, regarding the speed of a fluid flowing out of an opening, which was later shown to be a particular case of Bernoulli's principle. Torricelli's experiments with liquids and gases added to the development of a new scientific world view which broke away from Aristotelian and Church authority during the seventeenth century. He was a committed Copernican and advocate of Galileo's theories who was familiar with the works of Johannes Kepler and other revolutionary thinkers of his age. His invention of the barometer opened a new era of experimentation in physics and meteorology. Pascal, Lavoisier and others used the new instrument and Torricelli's theories to verify the reality of air pressure and mechanical reality. In the case of Pascal the new understandings led to a liberal and progressive view of scientific progress in the discovery of truth. The impact of Torricelli's discoveries can be seen in the writings of Blaise Pascal as well others who demanded a rational and scientific approach to exploring and understanding the world of natural phenomena. Torricelli's presentation of the mathematics of solids and curves rotated in space represents a segue from classical geometry and solid geometry to a newly emerging mathematics leading to modern calculus. Trattato del moto, Florence, before 1641. Lezioni accademiche, Florence, printed 1715. Esperienza dell'argento vivo, reprint, Berlin, 1897. De Gandt, François, and Armand Beaulieu. 1989. L'Œuvre de Torricelli: Science galiléenne et nouvelle géométrie. Paris: Diffusion, Les Belles Lettres. OCLC 26398270. Torricelli, Evangelista (1608-1647) World of Earth Science. Ed. K. Lee Lerner and Brenda Wilmoth Lerner. Gale Group, Inc., 2003. eNotes.com. 2006. Retrieved February 12, 2008. All links retrieved August 10, 2017. This page was last modified on 10 August 2017, at 18:19.